Want to go down the cloud home decor route and make a big impact? There’s a piece for that. Just landed here at KIDLY, this A Lovely Little Company Cloud Neon Style Light gives the cloud trend a retro twist. Easy to hang and with a built in adapter, it emits a soft glow to help them sleep. And it doesn't get hot either. Awesome looking and practical, you’ll want one for your living room too. Trust us. Liewood is known for its stylish Scandi offerings and we’re big fans here at KIDLY (obvs). So when they introduce clouds into the mix, well, you can imagine how excited we get. This Liewood Clara Cloud Mobile features a simple monchrome cloud, given a colourful twist with rainbow pom poms (also a huge trend dontcha know). 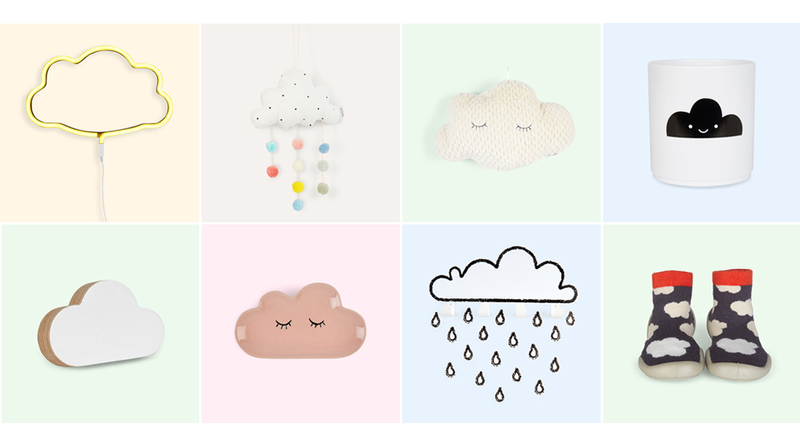 It’s great for adding Scandi style, as well as the cloud trend, to their nursery. We’re totally in love with Bloomingville’s home decor. A new brand to KIDLY, they make stylish pieces that look great in the nursery and any other part of your home too. And they’ve gone cloud crazy this season. Not that we’re complaining. First on the list is this Bloomingville Cloud Cushion. Plush and super soft, we love the simple eyelash detailing, which is becoming another trend at the moment. It looks great in their nursery, whether it’s in the cot, or hung up on their wall - there’s a little tab that lets you do that easily - or, be bold and buy it for your living room. A new brand to land at KIDLY, this company handcrafts wall hooks in its studio in Brisbane. Styling up our lives at the moment is this Knobbly Cloud Wall Hook. It comes in a range of colours and can hold up to 10kg, making it perfect for coats and bags. Or, make the cloud theme even more prominent by using these hooks to hold cloud string lights too. Complete with Knobbly's Wall Mate and installation instructions, it’s also simple to put up. Winning. So, we’ve already raved about this brand’s love of clouds, but we couldn’t do a round-up without mentioning this Bloomingville Cloud Plate. In a ceramic design, and featuring an eyelash design against a pink background, stylish dining starts here. We love how you can also use it for adult snacks. Just buy a few to make a culinary cloud collection. If you want to go big with the cloud theme, then we’ve got something that will really make a statement. That’s thanks to Tresxics. This Spanish company makes a range of decor that helps you keep your style, while adding fun to their rooms. And this Tresxics Big Cloud Hook & Raindrops Wall Stickers Set is a great example. This four hook cloud, features a grey outline for a hint of illustration. It can be hung on it’s own, or added to with the mini cloud wall stickers. Oh, and it’s also handy for hanging their accessories and dressing gowns too. Yay! Collegien is always bang on-trend with its slipper designs, so we weren’t surprised when it came up with these Glow in the Dark Cloud Slipper Socks. In a cool cloud print and with glow in the dark features, these awesome slippers with a non-slip sole are a perfect pair. Sadly, this is a cloud idea solely for the kids #sorrynotsorry. So there we go. A few key cloud home decor and clothing pieces to help you style the cloud trend. Want more? Check out some of our other faves below.